I don’t pretend to come up with a unique hair style for every week as there is much more to life. 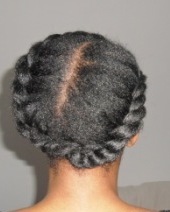 This is more or less my Week 11 style but without the flat twists going from the centre outwards. I was too tired for perfection.